The Indian Clubs roots stem from a war club or gada – an ancient weapon of invincible physical prowess and worldly power (1) from India. The first record of it being used as a health and fitness tool was by Persian Pehlwani wrestlers (2). In the 19th century British soldiers stationed in India saw club swinging first hand. This ancient practice made its way back to England and soon spread throughout Europe. The Germans and Czechs integrated club swinging into their training systems (3). Friedrich Ludwig Jahn ‘The father of German Gymnastics” was largely responsible for the physical education in Germany and helped popularize gymnastics and club swinging. Education in the United States up to this point was mostly focused on intellectual study and a true physical education system was absent. In the early 1800’s, three followers of Friedrich Ludwig Jahn escaped political persecution by fleeing to the United States (4). These three men: Charles Beck, Charles Follen, and Francis Lieber would help lay the foundation for the future of physical education in the United States. In 1825 Beck became the first recognized physical educator in the United States and soon opened the first gymnasium in the country at Round Hill School, Northampton, Massachusetts. The following year Beck assisted his friend Charles Follen in opening the first college gymnasium at Harvard University. Lieber took over for Follen in 1827. Fast forward to 1852 and the first intercollegiate sport – rowing – began with a duel race between Harvard and Yale. Dr. Edward Hitchcock Jr. was appointed as the director of the department of hygiene and physical education by Amherst College, the first such recognized position in the United States. Diocletian Lewis founded the Boston Normal Institute for Physical Education (also known as Boston Normal Physical Training School), the first teacher training school for physical education (Note: 1861 marked the beginning of the American Civil War as well) (4). St Pauls Young Mens Society Indian Club Swinging Team, Ipswich, 1890s. Photo from Wikipedia. Indian Club Swinging became a staple in the US Army’s basic training for World War I and it was even an official sport at the 1904 and 1932 Olympics! Indian Club swinging continued to be used in the early 20th century but the interest in it declined as the popularity of sports such as football, basketball, golf, and baseball became part of America’s culture and pasttime. Luckily thanks to folks such as Dr. Ed Thomas, Gray Cook, Brett Jones, and Phil Scarito the authenticity and practice of Indian Club Swinging is experiencing a revival in recent years. Dr. Ed Thomas, Me, Brett Jones, and Phil Scarito at the Indian Club Workshop in July 2015. 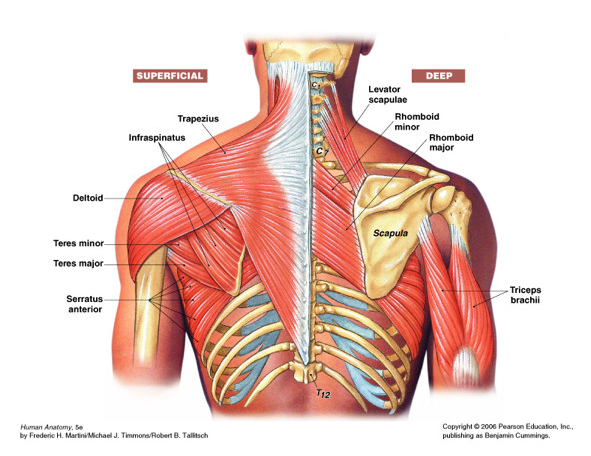 The shoulder is the most mobile joint in the body but also the most susceptible to injury. The rowing stroke – sweep or sculling – places the shoulder in a weak position. Most of the injuries that occur in rowing are classified as overuse injuries or injuries that occur from repetitive motion. The issue may be more nuanced than that, where the poor position of the shoulder is coupled with equally poor posture and an inability to control force and that is what leads to injury. My experience, both personal and with my clients, is that stabilizing the shoulder girdle and improving posture, makes for stronger rowers that are less prone to injury. The catch position in the rowing stroke. Note the rotation through the shoulder and thoracic spine. 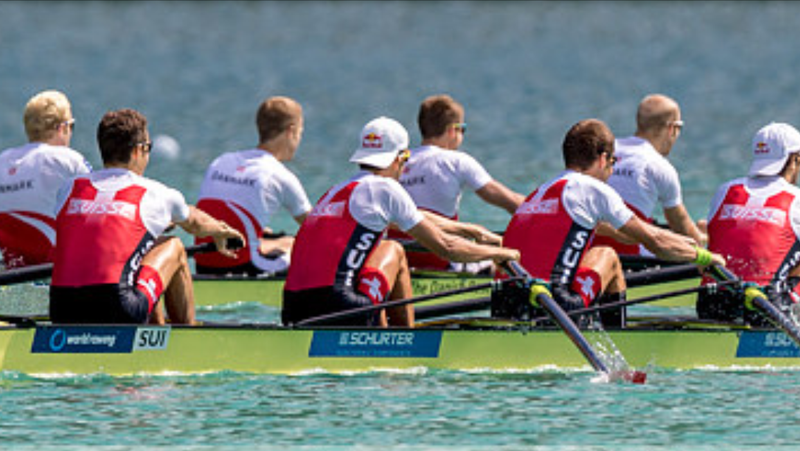 World Rowing lists some of the most prevalent injuries involving the shoulder to be impingement syndrome and shoulder instability (5). An impingement occurs when the acromion rubs against the tendon and bursa causing irritation. If you have ever raised your arm and feel pain or are unable to continue to a ‘pinching’ sensation you have experienced shoulder impingement. Impingement and shoulder instability can occur from poor scapular control, poor posture, over reaching at the catch, and lunging at the catch. The scapula in the outside shoulder can become very unstable often due to the excessive rotation and/or reaching across the body at the catch. A lack of thoracic spine extension and rotation often plays a factor as well. Often times rowers are disconnecting the shoulder from the body and lack the ability to dynamically stabilize the scapula at the catch. Sometimes it can be a simple case of robbing Peter to pay Paul. If you lack mobility in your thoracic spine your body will begin to take a stable joint such as the scapula and make it mobile. This is why it is so critical to look at the entire body as it moves. 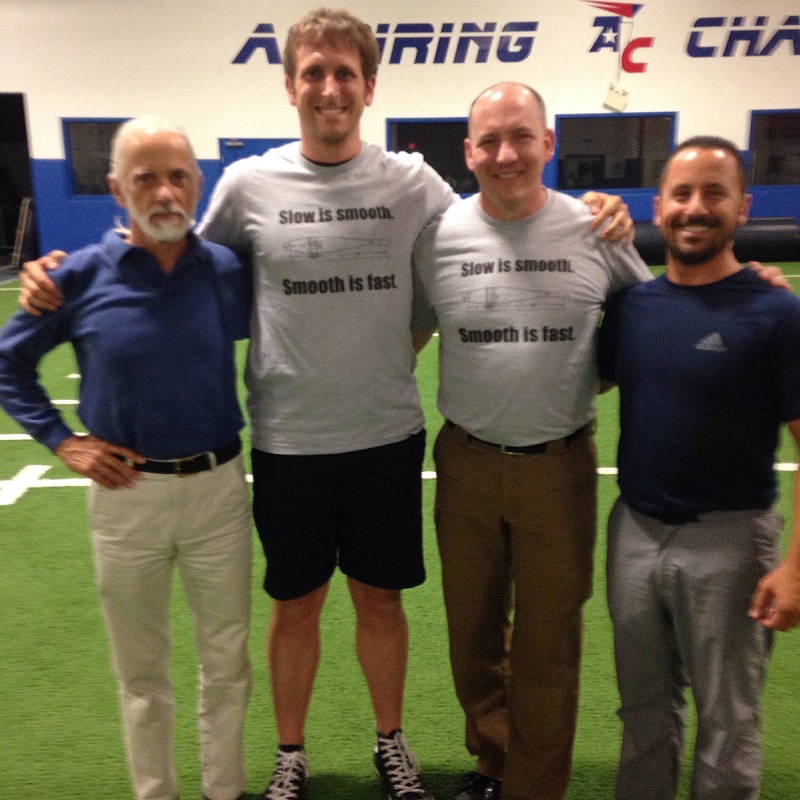 Remember, the brain does not care how it performs a movement, it is simply trying to execute and survive – and it will sacrifice quality of movement for quantity of movement every time. My contention with most of these recommendations is 1) drugs will only mask the pain and provide a temporary alleviation but will not be a long term solution and 2) the exercises are focused on strengthening the shoulder muscles in isolation. This is not reflective of the rowing stroke or movement overall. Strengthening the shoulder muscles in a seated row or doing a scapular strengthening exercise will help improve the strength of those muscles. However, it does not mean that those muscles will be able to work in harmony and provide stability in a complex, dynamic movement such as the rowing stroke. Hence, the reason for working with Indian Clubs. Indian Club Swinging will help rowers improve timing, coordination, and rhythm outside the boat. Brett Jones, Chief SFG and co-author of Club Swinging Essentials sums it up perfectly. What requires more neural engagement? A seated cable row or Indian Club swinging? Rowing on the erg or rowing all eight down the course at 38 strokes per minute? 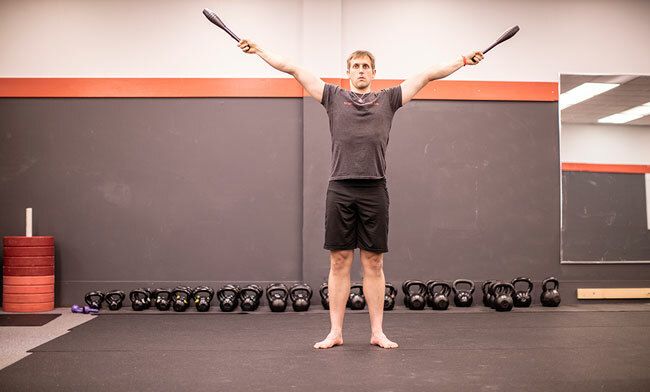 Indian Club Swinging will help rowers develop greater awareness and movement competency and restore shoulder health. Stay tuned for future video blog articles providing tutorials on Indian Club Swinging, kettlebells, and bodyweight! Leave your comments below and make sure to share the article with the social media toolbar on the right! Jones, Brett. Cook, Gray. Thomas, Dr. Ed. Club Swinging Essentials. Functional Movement Systems. 2010. Print. McKay, Brett and Kate. An Introduction to Indian Club Training. The Art of Manliness. Website. March 16, 2015. Thomas, Dr. Ed. Club Swinging: An Ancient Restorative Art for Martial Artists. Old Time Strongman. Website. Gill, Brian; Jones, Brett; Cook, Gray; Thomas, Dr. Ed. Restorative Exercise with Indian Clubs Manual – Part I. 2014. PDF. Hannafin, Dr. Jo A. Common Rowing Injuries: Prevention and Treatment. World Rowing. PDF. 2011. You’re welcome. Please let me know if you have additional questions or suggestions for future blog articles. Have a great day.